Inspired by Belly Dancers and the joy of all Dancers! 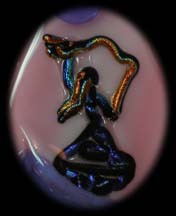 Dancers are created in Dichroic and fused in glass. Pendants created with hole ready for stringing on leather, wire, ribbon or cording. 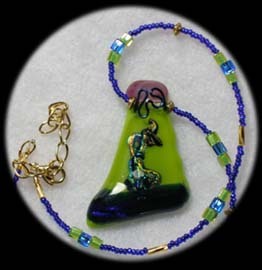 Measuring between 1" and 3" long, they are beautiful hanging around your neck or dangling from your car mirror!